Too many people see a colorful parrot, a cool reptile or a cuddly pocket pet on television or at a friend’s house and think, I just have to have one!, before they learn anything about what these pets eat, how much space they require, how they behave and, for some animals, whether they are even legal in their locales. Without proper knowledge of what these animals require, you might end up with a pet that is not what you expected, and a frustrated owner often leads to a neglected pet. Owner disappointment is what leads many exotic pets to end up in shelters to begin with, so be an educated adopter and do your research. Talk to your veterinarian first or, if your veterinarian doesn’t treat exotics, ask for a referral to one who does. If you have other family members in your household, you should certainly consult with them to make sure everyone will welcome the new pet. If a family member is afraid of snakes for example, you might want to think twice. Most shelters will allow several family members to interact with an adoptable pet before the family makes a decision to ensure that everyone is in agreement that the pet is a good fit. Always alert the shelter first if you are visiting with multiple family members. 3. Make sure everyone will get along. Some shelters will even let families bring in their other pets to see how they interact with the new animal. However, before you do that, make sure the animals are suitable to be introduced. In general, same species animals are OK to introduce to each other, as long as they are supervised. However, predator species, such as cats, dogs and ferrets, should never be brought to meet prey species, such as parrots, rabbits and rodents. Even some prey species, such as rabbits and guinea pigs, should not be allowed to mix due to concerns about shared diseases. If you’re interested in a specific pet at a shelter, you should plan to visit the animal several times before making a final decision. Just like people, animals can have “off days” when they are tired or cranky. So more than one interaction with the animal is essential to really evaluate its personality and to see how it interacts with you and your family. Is the pet shy? Outgoing? Mischievous? Aggressive? Nervous? Does the animal prefer men to women or women to men? Does it like children, or is it afraid of them? These are traits you’ll want to consider before making a final choice to help ensure that particular pet is right for you. Unlike most dogs and cats, several exotic species (particularly medium-to-large-size parrots; certain turtles, tortoises and other reptiles; and some species of rodents, such as chinchillas) may live a very long time — some for decades. So if you are considering adopting one of these animals as a pet, you’ll want to think about who will care for this animal over the long term and whether you have the finances and the time to do so. Exotic pets are a big investment of both time and money. Don’t get caught with only short-term planning! 6. Have your new addition checked out. Don’t forget this very important step. The first thing that most new dog and cat owners do after bringing their pets home from the shelter (or at least we hope they do!) is call their veterinarian to set up an appointment for a checkup. It’s also a good idea to keep a new pet away from any existing pets until it’s been examined. Unfortunately, new exotic pet owners often forget this critical step and end up waiting until their new pets get sick to introduce them to the vet. Most exotic pets — whether a bird, bunny or bearded dragon — have very specific food and housing requirements, and many people are not educated on the most up-to-date care for their exotic pets when they first take them home. As a result, many new exotic pets are not cared for properly and end up becoming ill or behaving inappropriately. 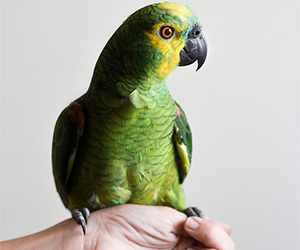 In addition, many new exotic pet owners are unaware that several species of exotic pets need preventive medical care, such as deworming and vaccination. A trip to the veterinarian with a new exotic pet, regardless of species, can help avoid problems and promote a happier, healthier pet-owner relationship. If you’ve followed the steps above and adopted a new exotic family member in a logical, well-thought-out way, get the seal of health from your veterinarian and enjoy your new addition!